A once-in-a-lifetime experience awaits on this Cuba travel program! Join Globus and be among the first American travelers in five decades to visit Cuba and its most fascinating cities. This special people-to-people program allows Americans and Cubans to share meaningful interactions while enjoying the rich history and culture of this amazing country. Every day of your travel program is filled with compelling educational activities and conversations, where both Cubans and Americans can openly share their ideas and opinions. Participate in discussions about Cuba’s history, agriculture, music, religion, and art. You can embrace Cuban culture when you meet and join in a discussion with the dancers of the world-renowned Camagüey Ballet Company; interact with local artists and exchange views on the importance of art to a community; engage with musicians who will introduce you to son, Cuba’s popular music; discuss private enterprise in Cuba with local owners and staff; and meet Cuban baseball players to discuss this favorite pastime in both Cuba and the U.S. All people-to-people interactions weave seamlessly into the daily visits around the country, serving to enrich and enlighten. On this Cuba tour program, you’ll also have a chance to explore some of Cuba’s colonial cities with their cobblestone streets and historic architecture. In fact, the city centers of Camagüey, Trinidad, and Havana have all been named UNESCO World Heritage Sites. Fascinating, informative, and insightful discoveries await you on this rare opportunity to visit the “Pearl of the Antilles.” It’s an experience like no other! The “Cuba’s Charming Colonial Cities & Havana” program requires walking on cobblestone streets and uneven pathways, climbing stairs, and participating in a full-time schedule of people-to-people activities. Arrive in Camagüey, Cuba’s third-largest city and transfer to your hotel. 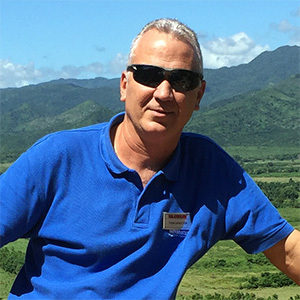 Tonight, meet your Globus Group Leader and Cuban National Tour Director for a 7 pm welcome dinner. This is a good time to meet fellow program participants, get your questions answered, and prepare for your time in fascinating Cuba. This morning, see the city’s beautifully restored plazas and learn why Camagüey is nicknamed the “City of Squares.” One of the first seven villages founded by the Spaniards, much of the city has been declared a UNESCO World Heritage Site. Next, meet dancers with the world-renowned Camagüey BALLET COMPANY, which has performed in over 40 countries. You’ll have a chance to meet and interact with the dancers, teachers, and costume-makers. Journey to KING RANCH, an expansion of the famous Texas ranch of the same name, and its neighboring village, and step inside a home to discuss rural life. Then, over a barbecue lunch, connect with the cowboys who call the ranch home. Stop at CASANOVA POTTERY STUDIO to learn about Camagüey’s famous tinajones—large red pots found outside homes, a symbol of the city. See the traditional way of making the vessels and interact with the artists to learn the local legend. This evening is free to explore more of Camagüey on your own. 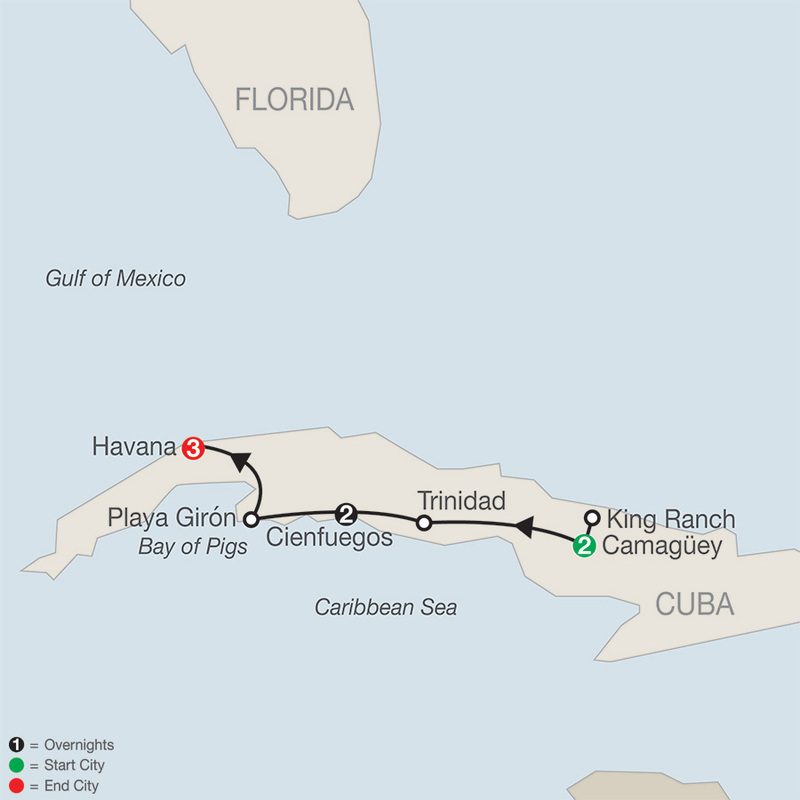 Travel to Trinidad, crown jewel of Cuba’s colonial cities, founded in 1514 and today a UNESCO World Heritage Site. Upon arrival, enjoy lunch at a CASA PARTICULAR (bed & breakfast) and discuss private enterprise in Cuba with the owners and staff. This afternoon, stroll the streets of Trinidad, a cobblestone showcase of colonial architecture and pastelcolored houses decorated with wooden shutters and wrought-iron grilles. Caged songbirds outside the home are a Trinidad tradition. Spend time at TEMPLO YEMAYA to discuss Santeria. The religion was first brought to Cuba by African slaves who worked at the sugar plantations, and it has connections to Roman Catholicism and Native Indian traditions. Continue to Cienfuegos for a 2-night stay. Start the day by engaging with tobacco rollers at a CIGAR FACTORY, and learn about the importance of tobacco, both culturally and commercially, for Cuba. Next, get acquainted with Cienfuegos on a walking tour around the main square. Settled by immigrants from France and Louisiana more than 150 years ago, Cienfuegos is often referred to as the “Pearl of the South” because of its impressive beauty and colorful history. Join in a discussion with artists at a GRAPHIC ARTS STUDIO and learn more about their lives, work, and how their art is created. Before returning to your hotel, enjoy a performance and discussion with the Cienfuegos ORCHESTRA. Dinner is served at a local paladar. After breakfast, travel through the countryside, passing sugar cane fields and banana plantations. We’ll stop in Playa Girón for a guided visit of the BAY OF PIGS MUSEUM. Nearby is the old sugar mill used by Fidel Castro as his center of operations during the 1961 invasion. Over lunch, join in a DISCUSSION with a local Naturalist as well as the family that runs the restaurant. Arrive in Havana and interact with the young member of EN BUSCA DEL SOL (in Search of the sun), a community project founded by a local artist. This evening you are free to explore Havana on your own. Your Cuban Tour Director will have suggestions for dining and additional sightseeing. Your day begins with a walk through the streets of OLD HAVANA, A UNESCO World Heritage Site. Discuss with your Cuban Tour Director Havana’s unique architecture, the challenges of renovating the city’s exquisite historic buildings, and the future of these restorations. Next, our attention turns to Nobel Prize-winning novelist Ernest Hemingway, who lived in Cuba for more than 30 years and left behind an enduring legacy. It is here that he wrote several books, participated in fishing contests, and enjoyed the laid-back ambiance and warmth of the Cuban people. Engage with staff at FINCA VIGIA, his beloved home, and see his fishing boat, El Pilar. Next, visit a COMMUNITY PROJECT to interact with the children and volunteers who run the program. This evening is free to explore Havana on your own. You may wish to visit the famous Tropicana Nightclub, see a baseball game (seasonal), visit some of Hemingway’s old haunts, or explore the charming cobblestone streets of Old Havana. Explore the world-famous COLON CEMETERY with its elaborately sculpted memorials. Hear the cemetery’s captivating history, folklore, and stories about the many noteworthy people laid to rest here, including musicians, filmmakers, writers, politicians, Major League Baseball players, and La Milagrosa—the “Miraculous One.” Afterward, tour the illustrious HOTEL NACIONAL DE CUBA, a symbol of history, culture, and Cuban identity. The hotel has hosted celebrities and world figures over the decades, including Winston Churchill, Frank Sinatra, Muhammad Ali, and Steven Spielberg. Over lunch, meet former Cuban baseball players for a DISCUSSION about the history and the love of this favorite pastime in Cuba and the United States. Next, visit JOSÉ FUSTER’S STUDIO, cleverly nicknamed the “Picasso of the Caribbean.” Here, you’ll discover a surreal world—like nothing you’ve seen before. Interact with members of the neighborhood to discuss the project’s impact on the surrounding area. Before your farewell dinner this evening, enjoy a ride in an OLD STYLER car—the perfect ending to your time in Cuba.